In the review of Daan's solo-CD "Profools" I was wondering what came first : Dead Man Ray of Daan. Now the answer seems to have been given, because from this cd Dead Man Ray seems to have really become a group, rather than the collision of two talented individuals. Drawback to this is that the qualities of Daan (melody and great voice) have been stashed away deeper into the pockets of the songs. Where "Berchem" easily brought connotations to mind of popbands such as The The, these are much further away on "Trap". I've been racking my brains to find the line between the good and the bad stuff on this album (because it was clear from the start that, despite the severe selection the group says to have made from all recorded songs, that not everything that has landed on the disc is all good). In the end it occurred me that the distinction is that between the short songs, and the ones that clock at more than 4 minutes. The most convincing were the dark "Woods", the triumphant "Brenner", the funny (albeit heard once too often) "Toothpaste", the mysterious "Slow Indian" and the claustrophobic "Tunnels". Despite their experimental songwriting-technique (jamsessions that are cut up and manipulated by computer) Dead Man Ray is still the most accessible project of the lefthanded centipede Rudy Trouvé, certainly since he has disbanded the Kiss My Jazz collective. This makes it also one of the most intriguing and interesting Belgian rock bands that is out and about right now. "Trap" did nothing but confirm that. Het Zweepje : "Sometimes it's hard to find depth and the mystic in Belgian rock. The couple Daan-Trouvé has turned this around. "Trap" is a pearl filled with mysteries that you got to have. Just very deep!" 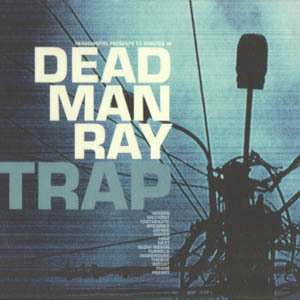 - ml in Rif-Raf : "At first glance, the new Dead Man Ray sounds incredibly messy ... It even takes a while to realize that Trap is no arty sound paste-up, but a true pop album. Totally recommended". - jub in Humo : "Dead Man Ray starts their new album "Trap" with the best song �Woods�, a fourandahalve minute ride on the subway from Disneyland to the Black Forest, with a stop in Bokrijk, on which platform AC/DC is jamming with Chris Isaak. We don't blame you for not being able to imagine anything from that. But take our word for it : this is meat and drink to us, and more meat, and more ... "Trap" is three quarters of a very strong album. And maybe we'll get that remaining quarter only in a year or so." - Nathalie Claeys in TheKindaMuzik : "They got me caught in their Trap and now I can't get out of it." - Bart van Dormael in Café Belge : "Don't even think that these are a bunch of traditionalist, since Daan Stuyven & co hide a lot of modern sounds and unusual breaks in their attic=rock. Subtle, charming, and at times even brilliant.". - Surf-Inn : "Cut-up beat, screeching gutiars, lost melodica's, TV-samples .. DMR love to build jammers into their own songs. When you've made you're way through these obstacles, you'll encounter very true popsongs such as "Woods", "Brenner", "Ham" and "Toothpaste""
- Marcel Vanthilt for Fun2Go : "A number of songs aren't loud enough to hear when I drive the E314 in my car ..."
You can order this CD from a number of locations (prices researched on May 23, 2000, but nothing guarantees they still are the same when you read this). - Deadmanray.com, de official site.